Leeds Rhinos: What's going wrong for last season's treble winners? Saturday's defeat by Salford Red Devils leaves Leeds Rhinos 11th in Super League with eight defeats from their opening 10 fixtures. Last season's treble winners are now 14 points off leaders Warrington and could potentially miss out on a place in the top four. BBC Sport looks at the contributing factors to the disappointing start to the season at Headingley. 10 October, 2015 probably feels like a long time ago to Leeds Rhinos fans right now. A long season ended at Old Trafford with a hard-fought Grand Final win over Wigan, which completed an historic treble for the club. The game also brought down the curtain on the rugby league careers of club legends Jamie Peacock, Kevin Sinfield and Kylie Leuluai. The experienced trio had helped the club to victories in Grand Finals, Challenge Cups and World Club Challenges and coach Brian McDermott openly admitted that he "could not sign a player in the world" who could replace Peacock. However, even McDermott could not have envisaged just how much the side would miss their input in the dressing room and on the field. Pretty much since day one of the campaign, Leeds have had considerable talent within the squad in the treatment room at Headingley rather than out on the pitch. Captain Danny McGuire was injured on the opening night of their treble defence, ruling him out until round nine's home defeat by Wakefield, and, following the exit of Sinfield, Peacock and Leuluai, his leadership has been even keenly missed. Tom Briscoe, Ashton Golding, Carl Ablett, Brett Ferres, Brett Delaney, Beau Falloon, Stevie Ward, Jamie Jones-Buchanan, Joel Moon, Ryan Hall, Jimmy Keinhorst and Keith Galloway have all missed games this season, the first three all in the same game at Widnes. Other clubs, notably Wigan, Huddersfield and Castleford have experienced similar injury problems, but Leeds' situation has been exacerbated by the departure of those talismanic figures at the end of 2015. It was a wet rather than a white Christmas in Leeds in 2015. The rain that came on Christmas Day had a devastating impact on thousands of people in the area, with 1,732 homes and 519 businesses flooded. The Rhinos' training base at Kirkstall was also badly damaged after the River Aire burst its banks - and the club are yet to return to their regular home. Chief executive Gary Hetherington put the financial cost of the floods in excess of £1m, but it seems that the floods are costing the team just as much on the field. 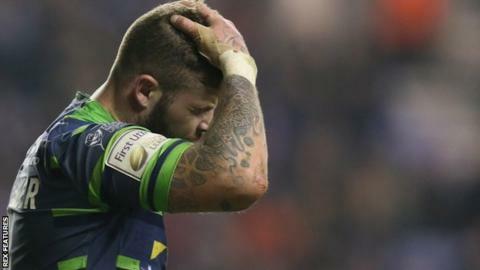 Prop Jamie Jones-Buchanan told BBC Radio Leeds after the defeat by Hull KR: "We are not in our usual environment which we have become akin to in the last 10 or 15 years. There is a lot of uprooted things to start with." Forward Adam Cuthbertson added: "We need to get back to how we were training before Kirkstall was taken away from us. It's made it hard for us because the facilities we've had have been very inconsistent. We've been able to get back down there for the first time this week and that is great for us." Leeds hope to be back in familiar surroundings full time sooner rather than later. "It's hard to pin the Rhinos' plight down to one particular issue. Their nomadic pre-season will undoubtedly have unsettled the squad. Players, after all, are very much creatures of habit and routine. "The amount of injuries suffered by the squad has also taken its toll, as has the subsequent challenge of re-integrating players back into the side. Dare we also mention the players that the Rhinos lost at the end of the season? "While the expertise of Sinfield, Peacock and Leuluai was always going to take some replacing, the loss of their combined experience has been more costly. "However, one thing is beyond debate. The fact that the Rhinos team just hasn't been playing well enough. They've conceded too many line breaks to the opposition and, while at times they've scrambled back to rescue the situation, it's left the team devoid of energy to mount a meaningful response. "Moreover, if the last 22 years at BBC Radio Leeds has taught me anything it's not to write off the Rhinos. They are the reigning champions after all."